This is the ultimate foodie experience in Madrid and it is designed just for you. With this Private Food Tour you'll be able to taste Madrid with a native guide and make it exclusive and customized to what you need. All dietary requirements can be attended. We're am looking forward to meeting you! Our Private Food Tour Madrid is our best Spanish Foodies Tour. Madrid is one of the most beautiful and tasty places in the world. Its culture and especially its gastronomy has a lot to offer. 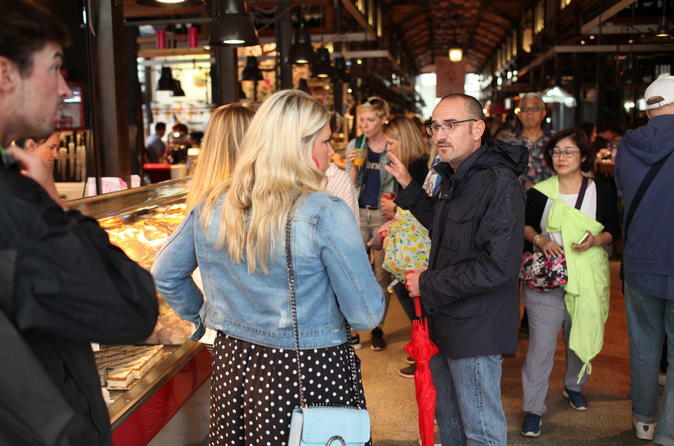 If you are visiting Madrid and you’re willing to do an authentic foodie experience with a passionate tour guide, Do not hesitate, this is for you! You can choose the starting time and the meeting point as long as it is within a walking distance from “Puerta del Sol” square. We can arrange all details by messages though viator so all you’ll have to worry about is enjoying the best Spanish tapas and pinchos in the city center. Locations like Barrio de las Letras, Puerta del Sol, Plaza Mayor, Mercado de San Miguel or Calle de la Cava Baja are in the itinerary. This private walking food tour in Madrid will be something to remember. In Spanish Tapas Madrid we are looking forward to be part of your trip to Madrid and this is a top choice. Satisfaction guaranteed! We will visit four tapas bars with the best expertise in their meals like Iberian products, Spanish omelette, prawns, cheeses paried with cava, vino tinto or blanco, sangria, cerveza. There will be soft drinks for children. One drink at each of the 4 bars and all food is included in the price. This is perfect for families, business groups, bachelor or hen parties! Any dietary restriction will be addressed. *Booking confirmation for private tours will depend on availability each time! *Free for children under 6! *For groups bigger than 15, please send a message.